Now that the market is back in trend mode following a correction we can ask the question: which stocks are poised to move significantly higher in 2019?When looking for stocks that have room to run, some of the best bets are those that are moving out from a recent base after setting a new all-time high for the first time in a few years. It isn’t always the first thrust to a new all-time high that leads to big gains, as this sort of breakout is fairly obvious especially when a stock is extended from its last base.Rather than buying the initial surge to a new high, waiting for some sort of base to form that is 5 to 20 weeks in length and within 20-35% of the recent high is ideal (unless the stock forms such a base just below the all-time high).A breakout from this base is a strong buy signal as can often lead to a significant rally when market conditions are healthy.It also helps to make sure the stock is in a top performing industry group. 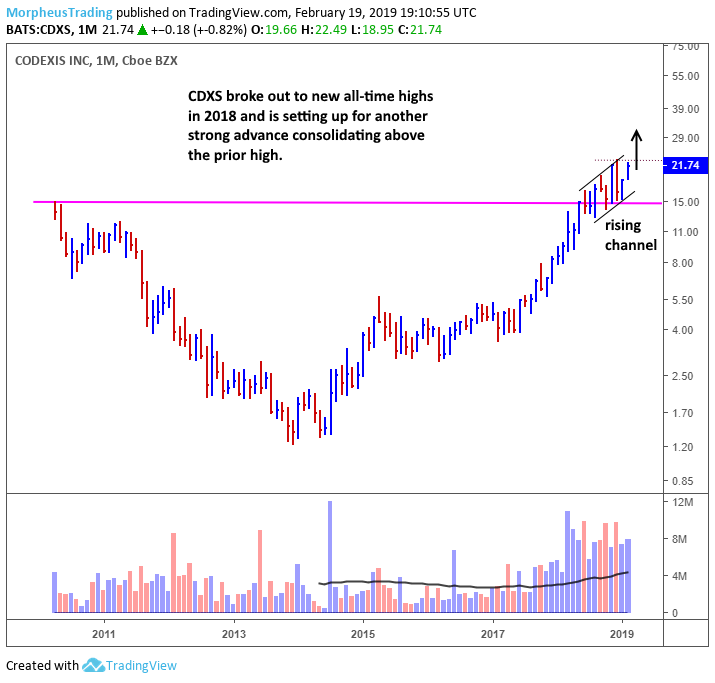 Codexis (CDXS) broke out to a new all-time high in 2018, clearing the prior high at $15 from 2010. Since clearing the high the past few breakouts attempts have failed to lead to a strong uptrend, but the price remains in a rising channel, which is bullish. 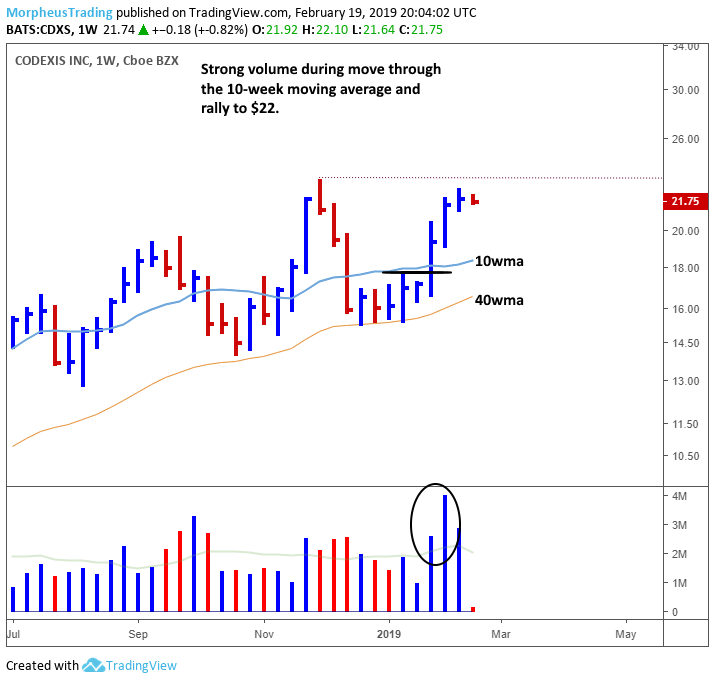 The weekly chart below shows the strong pick up in volume on the move through the 10-week MA. 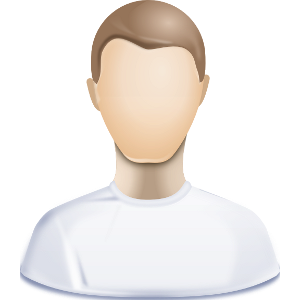 Look for CDXS to form a tight trading range during the next few weeks as a potential buy entry. A breakout to new all-time highs from the current base on volume would be a clear buy signal. 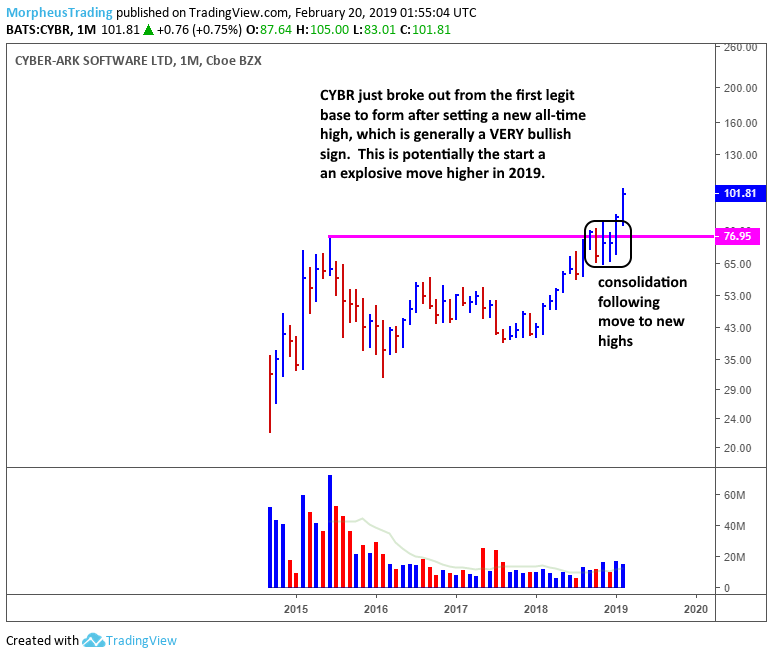 Cyberark Software (CYBR) moved to a new all-time high in 2018, clearing the prior high at $76 from 2015. The stall at $80 led to a three month long base that corrected 23% off the recent high. CYBR has already broken out from its base on volume but should be buyable on any test of the 10-week moving average on a weekly chart during the next few months. Splunk (SPLK) moved to a new all-time high in early 2018, clearing the previous high from 2014 but failing to follow through. The last breakout attempt in September failed along with the market, which led to a 22 week base that corrected 36% off the high. SPLK broke out from this base in early February but volume failed to impress. SPLK should be monitored for an entry after a few weeks of tight sideways action or on a test of the 50-day MA. Volume should come in on the next breakout if the stock is ready to launch higher. You can sign up for The Wagner Daily to keep up with the latest industry insights and trends here.